On the fortieth day after birth, the mother and child are invited for a prayer service to reunite the mother and unite the child to the church. This practice is based on the ancient Jewish rite and was experienced by Jesus and His mother Mary (recorded in Luke 2:22-40). This way the new mother has had the time to recover from giving birth and is able to peacefully bond with her newborn, whose immunity is also strengthening in its first weeks of life. The fortieth day churching rite is usually designated to be conducted at the Narthex. To schedule on or around the fortieth day please call or email the office. The contact information can be found on the right side of this page. The mother traditionally comes to church on the fortieth day after childbirth for special blessings. After the birth of her child a mother remains at home for forty days to recuperate and to care for her child. However, if the child has not survived, the woman still remains at home to heal physically and emotionally. During the time of her confinement, the mother does not normally receive Holy Communion, unless she is in danger of death. As the service is practiced in some traditions, churching involves both the blessing of the mother and the presentation of the child to God. In contemporary practice, it is rarely medically necessary and sometimes not even possible for the mother to remain confined in the home for forty days. Pastors must determine whether it is more important pastorally that the churching be the first thing the woman does upon leaving the home or that the churching happen on the symbolic fortieth day. Not all pastors make the same determination. On the day of her churching, the mother comes to the temple to receive a blessing as she begins attending church and receiving the Holy Mysteries once again. 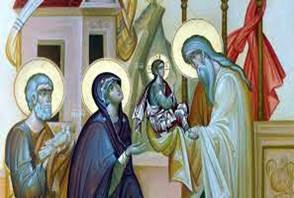 The child, that has already been cleansed and washed, is brought by the mother accompanied by the intended godparents who will stand at the child's baptism. They all stand together in the narthex of the church before the doors of the nave of the temple, facing east toward the altar. The priest blesses them and says prayers for the woman and the child, gives thanks for their wellbeing and asks God's grace and blessings upon them. 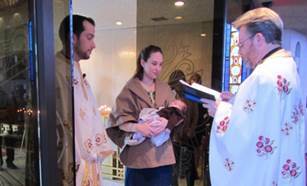 If the infant has already been baptized, the priest performs the churching of the child. If not, he does the churching immediately after the child's baptism. Taking up the child, the priest lifts it up, making the Sign of the Cross with the child before the doors of the temple, and saying: "The servant of God (Name) is churched, in the Name of the Father, and of the Son, and of the Holy Spirit. Amen." The priest then carries the child into the center of the nave, as he says, "I will go into Thy House. I will worship toward Thy Holy Temple in fear of Thee." Stopping in the center, he says, "The servant of God (Name) is churched, in the Name of the Father, and of the Son, and of the Holy Spirit. Amen. In the midst of the congregation I will sing praises unto Thee." He then walks up to the iconostasis, and stopping in front of the Royal Doors, he says, "The servant of God (Name) is churched, in the Name of the Father, and of the Son, and of the Holy Spirit. Amen." If the child is a girl, the priest places her on the solea in front of the icon of the Theotokos. If the child is a boy, he carries him through the south deacon's door into the altar and around the back of the Holy Table exiting the altar through the north deacon's door and again places the baby boy onto the solea.